"May God help these people who inflict such cruelty in the world," she tweeted. camera (Twitter/John McCain) Sen. John McCain, R-Ariz., tweeted this photo on August 22, 2017, with daughter Meghan McCain. Meghan McCain isn't keeping quiet about the hateful and hurtful comments being directed at her dad, Sen. John McCain, who is currently battling an aggressive type of brain cancer. At Donald Trump's rally in Phoenix on Wednesday night, a journalist tweeted that one of the president's supporters shouted at an anti-Trump protester, "McCain needs to die now!" Well, that didn't sit well with Meghan McCain, who took to Twitter, writing, "I wouldn't wish seeing this about your own father on my worst enemy. May God help these people who inflict such cruelty in the world." Meghan was in Arizona with her dad at the time of the rally, where the Republican lawmaker recently completed his first round of chemotherapy and radiation treatment at the Mayo Clinic. Anti-McCain sentiments among Trump and his supporters increased after McCain voted against legislation aimed at repealing and replacing the Affordable Care Act. At the rally, Trump did not identify Sen. McCain by name, but he did say -- to the delight of rally-goers -- "One vote away! I will not mention any names. Very presidential, isn't it?" 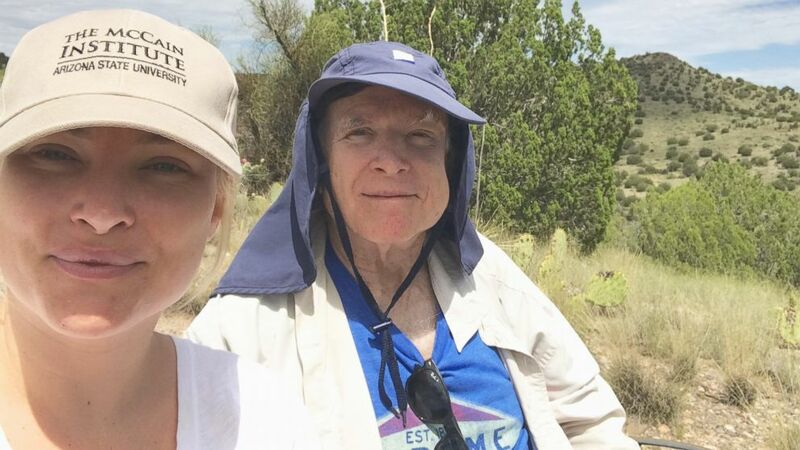 The previous day, Sen. McCain tweeted a photo of himself and Meghan McCain hiking, writing, "Watching the #SolarEclipse17 with @meghanmccain on a hike in #Arizona!"